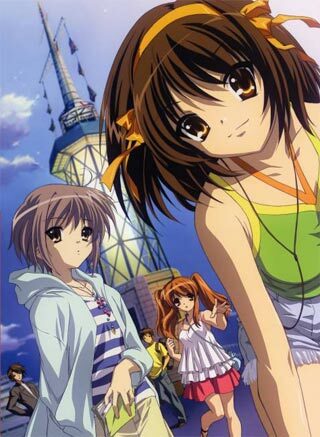 The Melancholy of Suzumiya Haruhi-chan is not to be confused with the series of The Melancholy of Haruhi Suzumiya, both titles has different illustrators. Rather this review is talking about the official parody spin off of the main manga title. This is also not a review for the light novel, of which the entire series is originated from. Reading this book means that you have already been a fan of Haruhi Suzumiya and want to get more into knowing the personalities and antics of the SOS Brigade. The Japanese society devotes much time and energy for students who attend school. Friends and clubs ultimately becomes a way of letting students gain friends and social experiences. 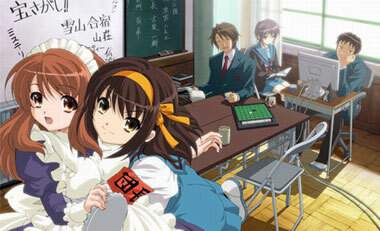 As an after school club the SOS Brigade must find things to do, and if things like going against the rival computer society, exploding something or finding fun at the strangest things, then as a reader there is a mean of enjoying the force of energy that is Haruhi. Reading graphic novels doesn't have to be plot heavy; Haruhi-chan is presented in a 4-koma style. What is 4-koma you might ask, 4-koma also known as yonkoma is a for panel manga presentation that primarily is used for gag comics. Many of the comics in this book present characters as super-deformed (SD) cute representations. So for quick laughs, this works quite well. Other graphic novels that use a 4-koma style are Lucky Star, Azumaga Daioh or Hetalia. 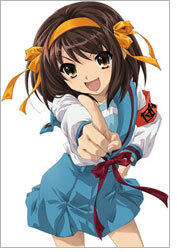 Haruhi Suzumiya is the strangest normal girl you've ever met. Despite being an average, headstrong girl, she's also an entity whose imagination dictates the very shape of our universe. She believes in time travelers, aliens, and psychics, thus they exist. The mainstay of the series is here, with the challenge of keeping Haruhi entertained enough that she doesn't subconsciously change everything, yet in the dark about it all. But what if that wasn't the case? The Disappearance of Haruhi Suzumiya, a movie based on the 4th novel, asks a very different question. Opening in the final days of the winter term, the students are dealing with the excessive cold, all the while preparing for Christmas. The next morning, Kyon, our male protagonist, wakes up in a world sans Haruhi Suzumiya. Combining "It's a Wonderful Life" with "The Twilight Zone", Kyon, who constantly complains about the hassle he had to deal with, is forced to suddenly wake up in a "normal" world where his closest friends don't remember him. While the entire effect "works," much of the experience is aided by the viewer's loose familiarity with the mythos. Sure, they explain "everything," but understanding who the characters are, makes their parallels richer, more enjoyable. Though, at a staggering 160 minute length, this movie is long. The pace is deliberate, and really paints the isolation the characters feel. While highly intentional, it doesn't alter the chunk of change the viewer invests. Covering the events of an entire novel, there are several mini-climaxes that mildly mar an otherwise brilliant film. Of course, this is understandable, and Kyoto Animation paid attention to painstaking details. But, what it boils down to is that a Haruhi fan is going to, at the very least, enjoy this movie. The real star of the film, Yuki Nagato, shows amazing amount of character with only the most minor shifts of behavior. The usually reserved, incredibly emotionless member of the story, the "normal" Yuki is just as reserved, though dripping with subtext. 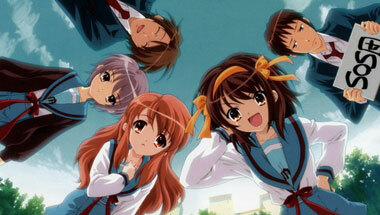 In fact, despite the movie's length, Haruhi, Koizumi, and Mikaru have a negligible amount of lines. If you can deal with that, then The Disappearance of Haruhi Suzumiya is a wonderful addition to the Haruhi mythos. Poor Kyon is the one that is stuck with the job of keeping the god entertained. The minute he decided that he is now a mature, logical, reasonable high schooler, all the things that he chose not to believe in showed up at school. Lovely, how they all just popped up: androids, time travelers, ESPers, and even his very own god. You know how all this loveliness began? Just like how most trouble begin for all guys: he opened his mouth and talked to a girl. 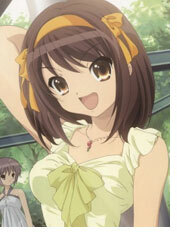 Of course, Kyon was very lucky: the girl that he talked to was Haruhi Suzumiya. She is the god that doesnít know that she is a god. He had to go and open his mouth to sarcastically suggest that she start up her own club because sheís bored with all the other normal clubs in their school. Before he knew it, Haruhi took his suggestion to heart and went around school appropriating club members. 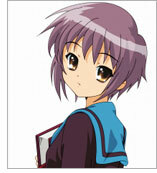 Yuki Nagato was the first to be recruited: Well, recruited is a word that will be use loosely. Yuki was quietly sitting in her Literary Club room reading when Haruhi decided that the room is now for her club and Yuki is going to be a member. 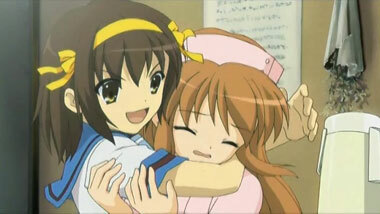 Mikuru Asahina and Itsuki Koizumi were next in line for recruitment and, last but not least, Kyon had to join so that the other members do not get tortured too much by Haruhi. Just like that, the SOS Brigade was formed to ìsave the world by overloading it with funî and, of course, search for the strange things in the world. Well, that's what Haruhi thought SOS Brigade was formed to do. In reality, SOS was formed to keep an eye on Haruhi so that she doesn't destroy the world. 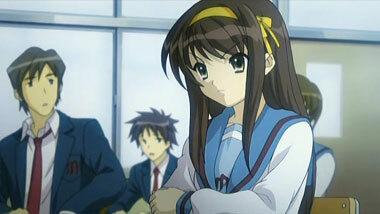 Yuki is an android sent by the Integrated Data Entity to gather more data about Haruhi. They want to know the extent of her powers and whether or not they can save the world if she decides to start everything all over with a clean slate. Mikuru is a time traveler. Everything about her mission other than her being a time traveler is classified information so we donít know which organization, if any, she represents or what her goal is in observing Haruhi. Itsuki is an ESPer with an organization called "The Agency", and he is sent to keep an eye on Haruhi's mood swings because that will be ultimately what decides the universe's fate, they believe. Where does Kyon fit into all of this since he is just a normal average everyday dude? Heís the guy that Haruhi secretly has a crush on and everyone decided he is going to be the one that is going to make sure she keeps the world the way it is. They all take turns telling him who they really are and, of course, the usual "please donít tell the god that she is a god" lecture. 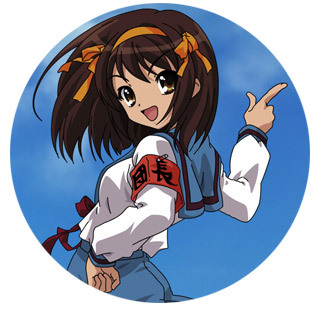 Since Haruhi just started high school, if she knew she was a god, she would probably start experimenting with her powers and her idea of changing the world to something more fun will definitely kill the boring stable universe that we know of today. So instead of protecting the SOS Brigade members from torture or making sure Haruhi stops harassing a cosplaying Mikuru, Kyon is busy running around entertaining his goddess and ensuring the world stays in the one piece that had always existed. The SOS Brigade will keep everything fun and lively for everyone; the world is depending on them after all. Below: Scenes from The Melancholy of Haruhi Suzumiya. 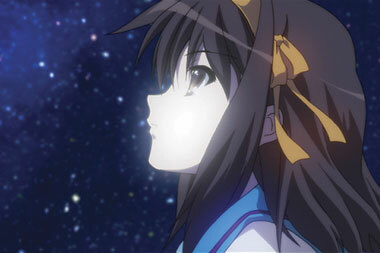 The Japanese trailer for The Disappearance of Haruhi Suzumiya. A Japanese commercial for The Disappearance of Haruhi Suzumiya. 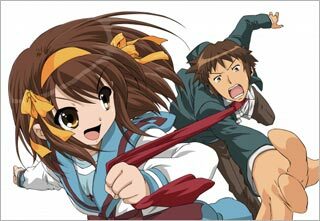 Below: Haruhi Suzumiya & ENOZ performs God knows... and Lost My Music at a school festival. 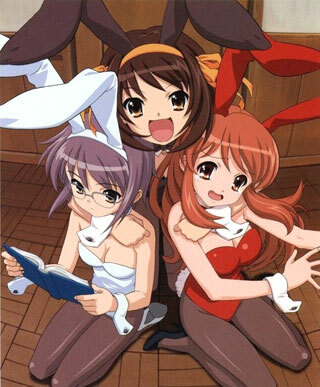 Below: Illustrations from The Melancholy of Haruhi Suzumiya.